With the 3-Park Lite SeaWorld, Aquatica and Busch Gardens Ticket, enjoy one-day admission to ALL THREE parks. Tickets are activated the first time you visit any of the parks and you then have a two week window to visit the other two parks. SeaWorld® Orlando is the world’s best loved marine park! Take a seat at the sensational shows starring Shamu®, enjoy up-close animal encounters and take the plunge on the thrilling rides including Manta that takes you face down through sea and sky. Take on Kraken Unleashed: Virtual Reality Experience, Florida's only Virtual Reality rollercoaster, and make the Journey to Atlantis®, this one-of-a-kind water coaster takes you through this mysterious lost city, where you’ll experience one of the steepest, fastest, wettest drops imaginable! Aquatica® is Orlando’s whimsical, one-of-a-kind waterpark that could only come from SeaWorld. Where slides spin and soak, including Dolphin Plunge® which will send you speeding past playful dolphins, to tranquil and rapid rivers and relaxing on white sand beaches. New for 2014, prepare for an adrenaline rushing experience like no other on Ihu's Breakaway Falls®, the world’s longest drop tower multi-slide ride of its kind. Riders will drop down the steepest, tallest 360-degree spirals in the southern United States! Busch Gardens® Tampa Bay brings together an unrivalled combination of rides, animals, and shows. Don’t miss Jungala, the home to Bengal tigers and orangutans and then challenge the incredible heights and speeds of SheiKra® and Montu®and Cheetah Hunt®, the ultimate launch coaster. This Summer, experience new heights with Falcon’s Fury®, the tallest freestanding drop tower in North America. At the rides highest point, you will pivot 90 degrees and dive face-down towards the ground at 60mph! The 3-Park Lite SeaWorld, Aquatica and Busch Gardens Ticket allows one (1) day admission to SeaWorld Orlando, Aquatica and Busch Gardens Tampa Bay. Tickets are activated the first time you visit any of the SeaWorld Florida parks and you must visit all 3 parks within a 14 day period from first use. The 3-Park Lite SeaWorld, Aquatica and Busch Gardens Ticket is only valid to use in the calendar year purchased e.g. 2019 Disney Tickets must be activated on or before 31 December 2019. 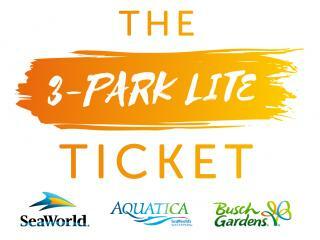 The 3-Park Lite SeaWorld, Aquatica and Busch Gardens Ticket does not include parking. Children 0-2 years of age are free of charge at all parks.